What do Michiganders dread most when the weather turns bitter? Freezing temperatures? Getting snowed in? Most people believe the greatest winter hazard is the ice that forms on our roads, walkways and parking lots. And black ice, slippery and invisible, is the most dangerous kind. A black ice accident may occur when there are sudden temperature drops, which for Michigan can be incredibly common. A black ice accident, slip and falls and motor vehicle crashes involve complex legal issues. Here is what you need to know. Black ice is actually a clear glaze. It is called black ice because it blends into the surface of the roads or walkways where it forms. It is likely to form in the early morning or evening when there is an abrupt temperature drop. Black ice is often found on bridges, overpasses and shaded areas of a road or parking lot. Black ice is usually impossible to see, which is what makes it so dangerous. Because it can resemble a wet blacktop, it’s important to be cautious when temperatures fall suddenly. 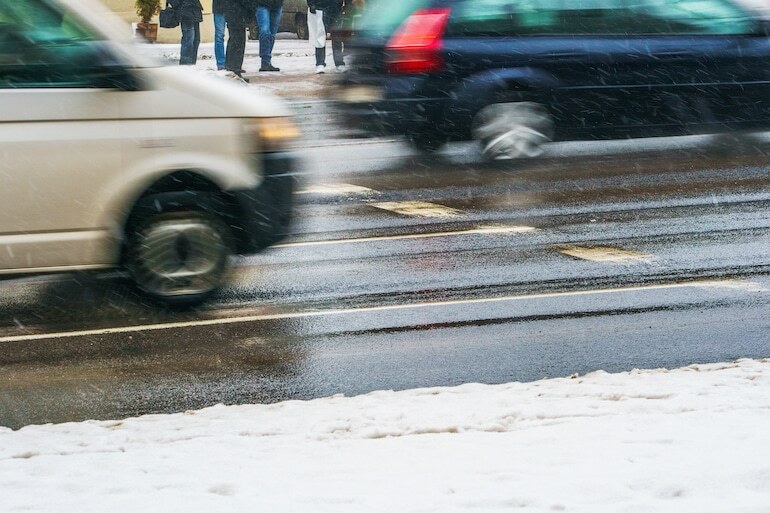 From a legal standpoint, black ice accident cases can be challenging. Michigan law includes an “open and obvious” doctrine that applies to most slip and fall cases. This means if someone of “average intelligence” should have noticed the hazard, the lawsuit will probably not succeed. However, when black ice is involved, the slip and fall case will depend on individual circumstances. It is equally difficult to determine fault in a black ice accident involving motor vehicles. Therefore, it’s important to contact an experienced injury lawyer if you are hurt in a fall or automobile crash. If you begin to skid, firmly press on the brakes to activate the anti-lock brake system (ABS). If your vehicle does not have anti-lock brakes, pump the brakes gently. Avoid spinning out. If your front end is sliding, steer in the opposite direction of the skid. If the back end is sliding, steer in the same direction. Switch standard tires to winter/snow tires before winter arrives. Drive slowly when black ice conditions exist. Drive below the posted speed limit and increase your following distance. Use appropriate child safety seats. Drive only when you are well-rested and alert. Avoid using cell phones or other distractions while driving. Walk carefully on sidewalks or parking lots where there is a possibility of black ice. Wear proper footwear, such as rubber-soled shoes or boots with good traction. Avoid walking on surfaces that have not been cleared or salted. Michigan personal injury laws are complicated, but finding the right lawyer is simple.